Convenience foods are often marketed in a deceptive manner – which makes it difficult to discern if you are truly getting a nutritious meal or if they are simply selling you the idea of nutrition. Like anyone else, I don’t always have time to cook. Life is busy and time is at a premium That’s why I always peak in the frozen food aisle to see if there are any new delicious food options available that will allow me to save calories and still eat healthy. 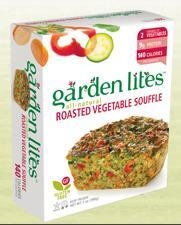 Garden Lite’s Veggie Soufflé is my newest frozen food find. I decided to try them out after I saw a woman at Whole Foods put more than half a dozen in her cart. This delicious frozen dish, whether you serve it as a meal or snack – is just 140 little calories and bursting with goodness and flavor. This soufflé is really perfect for taking with you, frozen, in your lunch bag to work – by the time lunch rolls around it will be thawed out and ready to stick in the microwave. So what do you get in this dish? Roasted veggies, of course, which are my favorites! You’ll find all of the old standby veggies that you love in this yummy dish, including potatoes, onions, broccoli, carrots, red peppers, and spinach – which I love. (If you recall, I’ve blogged about spinach in the past and why it is so healthy for you – and I recommended a delicious spinach pizza that I love and enjoy often). This soufflé is completely vegetarian and is made with egg whites. It is free from gluten and is kosher while packing a whopping eight grams of protein with no trans-fat or nasty saturated fat. The soufflé is 4 weight watchers points plus points. This looks good - I'll have to pick one up this weekend. Thanks! I love these Garden Lites souffles. Indeed I just put one in the oven for dinner before I checked your site. I live in the Bay Area as well, so it may have been me that you saw at Whole Foods dumping several of the Garden Lites into my cart! I eat these ALL the time! If you microwave them first, they are awesome chopped up and scrambled with eggs for breakfast! How funny. It very well could have been you. Hi Juliet, I love your blog! I purchased the Butternut squash gardenlite souffle but for some odd reason, it tasted REALLY fishy! Did I microwave it for too long?